Everybody wants to have a beautiful home, and you can start with your roof. It makes up for a large percentage of your home’s exterior look. If you want to get that classic yet affordable style, choose architectural shingles for your next roofing project. Architectural shingles, also known as laminated or dimensional shingles, are gaining popularity for Des Moines roofing. They are made of the same material as that of three-tab shingles, only they are thicker due to the layered styles. They also come in different shapes and sizes. Manufacturers normally use two to three layers of laminated material. They then apply mineral granules on top for texture. Due to its features, architectural shingles can mimic the look of slate, cedar, and clay tile. The different sizes and shapes also create a dimensional look for your roof. 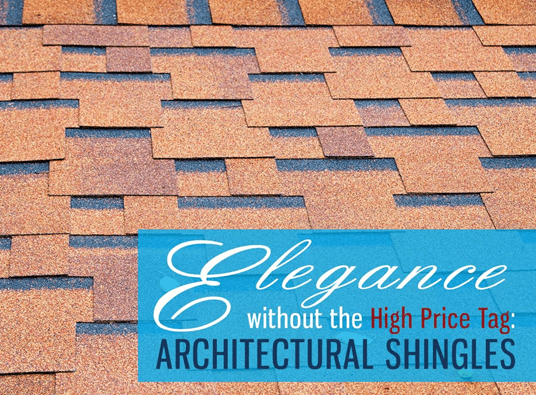 This type of shingle also comes in different colors and finishes for more curb appeal. They also look good on dramatic rooflines, gables, and turrets. Commercial roofing in Auburn made of architectural shingles also last longer compared with conventional shingles. This is due to their thickness. These shingles are also more resistant to fire and strong winds. Manufacturers such as GAF make architectural shingles with added insulating factor. Their Timberline® Cool Series can help you save up to 15% on total cooling costs. • Three-tab shingles – This line offers the most basic and affordable protection for your home. • Designer Lifetime shingles – These ensure beauty and protection for many years. • TruSlate™ – This alternative slate material is more affordable yet offers the benefits of real slate. We back our products and installation with GAF’s industry-leading warranties. These cover material defect and workmanship, each with different coverage periods. If you want to learn more about architectural shingles, call us today at (877) 212-9355. You can also schedule a free roof inspection when you fill out our contact form.